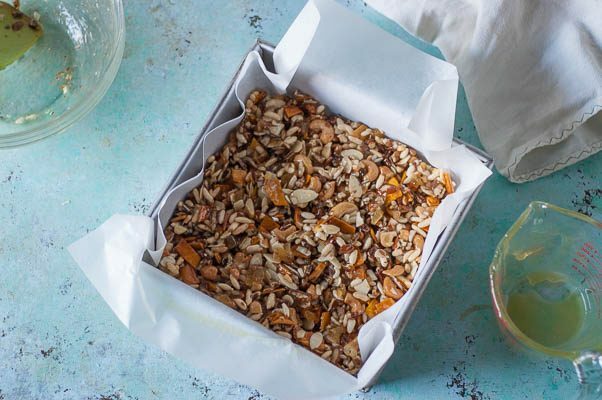 It took me years to get around to making granola bars (or energy bars or fruit and nut bars or whatever you’d like to call them). You see, I have this granola that I love and that I made regularly for years. But for reasons I can’t quite pinpoint, I seem to have lost the ability to keep it around. I still love it, and it is still my favorite breakfast cereal, but these days when I make it, it seems to disappear more quickly (ahem, Dan) and I don’t seem to be able to get into the rhythm of making a new batch in a timely fashion. Also, so many granola bars are overly hard or, like the Kudos I pined after in my youth, are basically candy bars with a wholesome veneer. But I’ll admit I have a soft spot for Kind Bars–the chewy, nutty, sometimes fruity, sometimes chocolatey, not-too-sweet snacks. They’re the type of thing I’ll grab when I’m on the verge of hangry in the grocery store and want something that will get me some quick nourishment without leaving me feeling crashy. What I didn’t realize is that they’re actually incredibly easy to make. 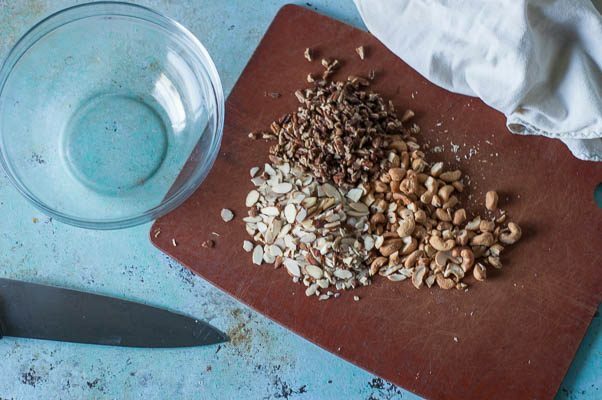 Mix some chopped nuts and puffed brown rice and dried fruit in a bowl, add some chopped crystallized ginger or unsweetened coconut flakes and maybe some some spices, pour some warmed brown rice syrup over the whole thing, pat it in a parchment-lined pan, bake, cool and cut. That’s it. And you can make any flavor you want. 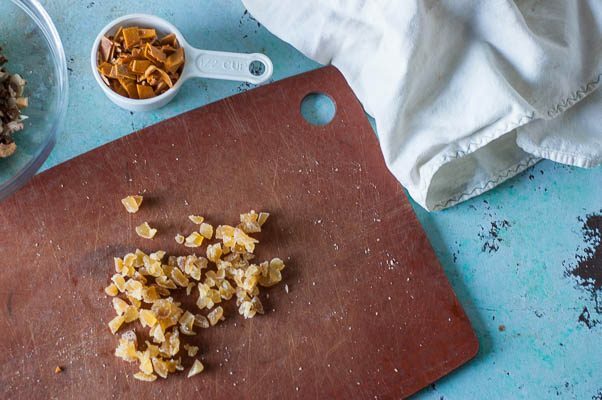 I’m partial to a mix of almonds, pecans, and cashews with chewy nubs of crystallized ginger added in. I’ve been experimenting with different kinds of dried fruit, and I’m playing around with a chocolate version too. 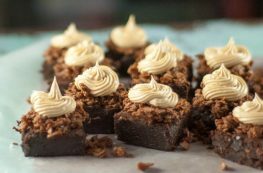 These are gluten free, vegan, and highly adaptable to your particular tastes. They’re a snack I’ve been thrilled to have around. I’m sending a batch of them to some dear friends who are about to welcome a brand new person (!) into the world. I hope that the one-handed sustenance will help to sustain them through these sleep-deprived days and nights. 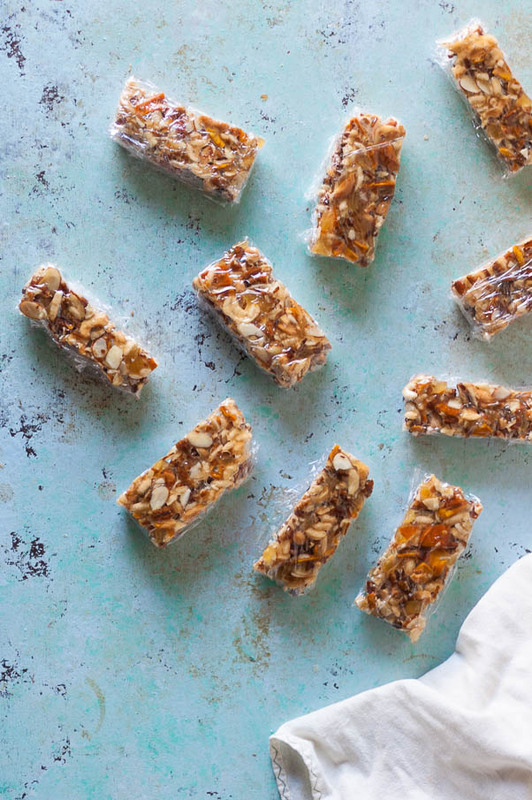 These chewy, nutty bars take about five minutes to put together and 20 minutes to bake. 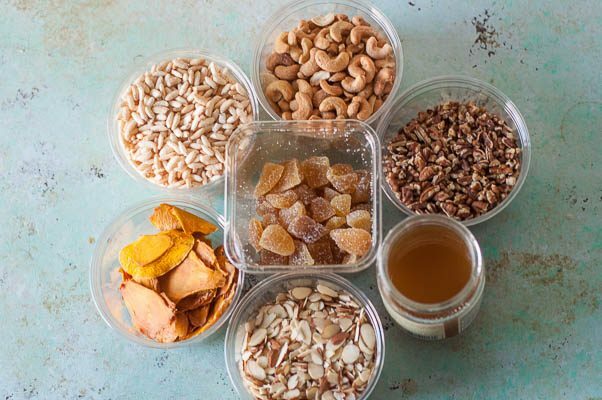 They are easily adaptable–you can use any dried fruits or nuts or seeds you like. You can use any puffed grain cereal from rice to millet to amaranth (even Rice Krispies will work). You can also add spices like cinnamon, unsweetened shredded coconut, or even chocolate. Be advised, however, that not all sweeteners will work here. I use brown rice syrup, which is available at many natural food stores (and online). 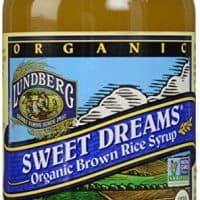 If brown rice syrup is not available where you are, you can also use corn syrup or glucose syrup. 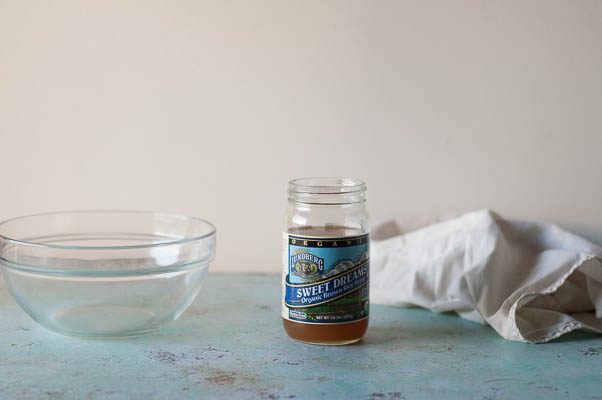 Don’t try to substitute agave nectar or maple syrup or honey here–they won’t work. These are vegan and gluten free, but because of the variability of these products, if you have dietary restrictions or gluten sensitivities it’s important to read the labels since some of these items may be processed on equipment that’s used for wheat products. Preheat oven to 325°F. 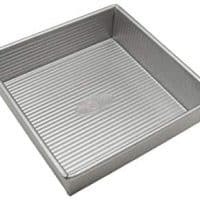 Line an 8 x 8 inch square baking pan with parchment paper and spray with nonstick spray or lightly coat with oil. Add the nuts, fruit, cereal, and ginger or coconut (if using) into a medium bowl and mix until combined. Heat the brown rice syrup in the microwave for about 15 seconds or until easily pourable. (Optional, but makes the mixing easier). Pour over the nut and fruit mixture and stir until everything is coated with syrup. Transfer the mixture to the parchment-lined baking pan and press into an even layer with a silicone spatula. Be sure to get into the corners and along the edges for more even bars. Bake for about 20 minutes, or until the edges are looking a little golden but the center still has some give. Let cool for 20 minutes, remove from the bars and parchment from the pan and place on a cutting board. With a sharp knife, slice into 10 bars. Wrap individually in plastic wrap. Store at room temperature for up to a week or freeze for up to a month. Oh my goodness! I love Kind bars. I eat one (sometimes two) every day! I never made my own before and I didn’t realize it was so easy! Thanks for sharing this recipe!! I know! It kind of blows my mind when some sort of packaged food is so easily reproducible in my home kitchen. These have a great payoff for the amount of work involved–so simple. Indeed! They’re so conveniently portable they’d be so easy to tuck in a pack. These look so easy and tasty! 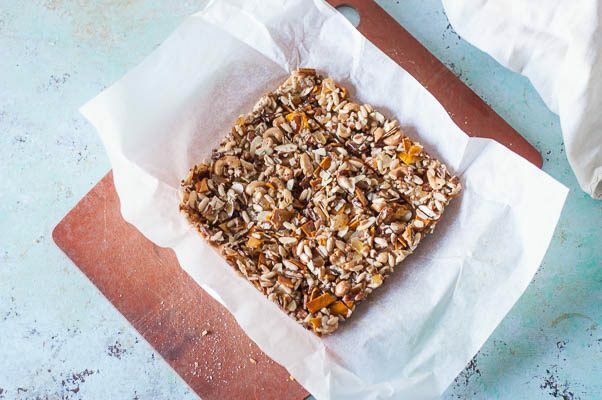 Gorgeous pictures – I want these kind bars now! Thanks, Kate! You should totally make some. 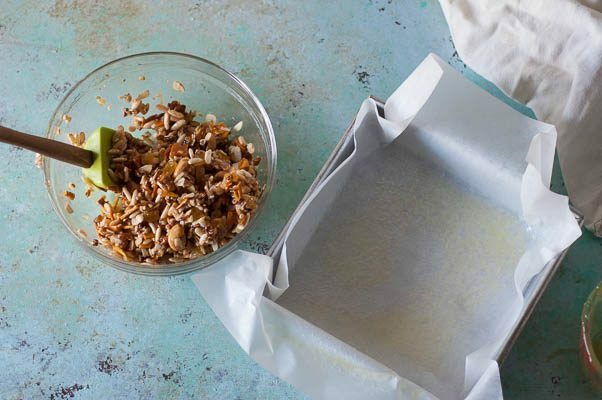 Love making homemade granola bars. You know exactly what is going into them…and you can pick the flavours you want to use. I’m so on board with you. These ones are so easy it makes me wonder what I was waiting for. I love these homemade treats! I’m printing this now so I can make them for some visiting family next week! Thank you! Thanks Patricia! Let me know how they turn out! Do you think I could replace the brown rice syrup with agave? No, agave won’t work here, it doesn’t have the same viscosity so it won’t hold the bars together. You can use glucose syrup or corn syrup, but those are the only substitutions for brown rice syrup I’d recommend.